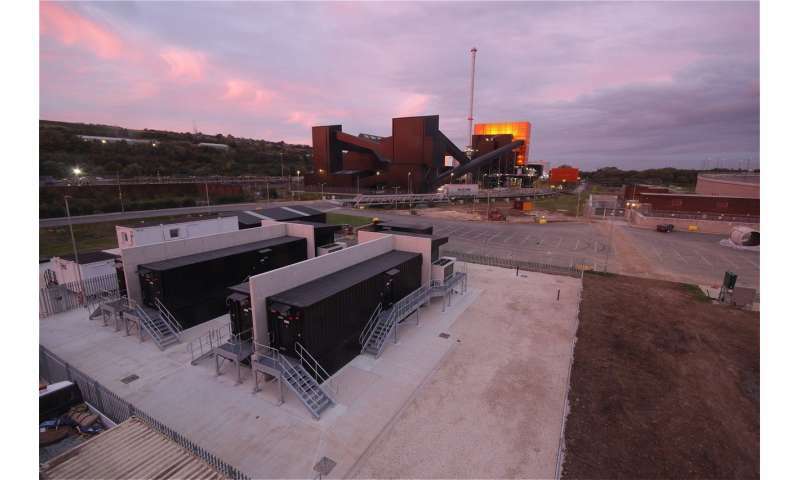 (Tech Xplore)—A battery installation at a UK biomass power plant is making news this month. Supporters call it an important recognition of the "enormous potential for battery solutions" in the UK. The company is E.ON. The challenge, as they attempt to meet it, is doing their bit to balance the grid. "Power supply and demand on the UK grid have to be matched closely in real-time to maintain a safe frequency so household electrical appliances function properly," said their company press release. "Balancing the grid is becoming more challenging because the growing range of renewable generation sources make the electricity system less stable and more prone to changes in frequency." A 10MW battery has been installed and connected to the grid near Sheffield. This is an installation and grid connection of a 10MW lithium-ion battery at the Blackburn Meadows biomass plant near Sheffield. The facility, is next to an existing power plant, said The Guardian. The E.ON release said the Blackburn Meadows plant is a 30MW renewable energy plant that can produce enough power for around 40,000 homes. The energy storage project is aimed to help keep power supplies stable, supporting the range of power sources feeding into the UK's national grid. The Guardian said the Facility, run by E.ON, will help the UK grid cope with fast-growing amount of renewable energy. Yes, you may consider this a giant battery. The battery is housed in four 40ft-long shipping containers. E.ON said the battery has the same power as roughly 100 family cars and holds the same amount of energy as 500,000 mobile phone batteries. The Guardian said the Blackburn Meadows battery is one of the biggest in Britain so far. The battery initiative is in response to a request from National Grid, said Adam Vaughan, The Guardian energy correspondent, for contracts to help it keep electricity supply and demand in balance— a grid challenge "as more intermittent wind and solar comes online." Battery systems play important roles in this context, as they can immediately discharge power. Leon Walker, Commercial Development Manager at National Grid, stated: "Using battery storage is a significant development for managing the national grid. It's an ultra-fast way of keeping electricity supply and demand balanced. Over four years we estimate that this service will save the system operator around £200m. This is good news for consumers who benefit from our cost efficiencies, and paves the way for battery technology to establish itself as an important component of our energy system." Vaughan discussed grid balancing too. "Balancing supply and demand is essential for keeping the frequency of electricity constant at 50Hz across the UK. The ability of batteries to respond to demand in less than a second makes them ideal for the task, with earlier sources of backup power much slower at just under 10 seconds." Interestingly, Scientific American had a look at large-scale battery storage in January where Daniel Cusick, E&E News, said that "the technology is preparing for unprecedented growth in the United States over the next several years." That would translate into stored electricity that can be dispatched quickly in case of power outages, shave peak demand charges or enhance grid reliability. Cusick also said that "batteries can smooth the ebbs and flows associated with wind and solar power by supplementing the grid when those resources are not available." "holds the same amount of energy as 500,000 mobile phone batteries." Okay. Now I just need to find out what is typical battery capacity in today's cell phones to be able to calculate how long the battery can produce 10MW power. Wriggle & Wriggle Before Death ! £200m Savings Over 4 years, i.e £50m/ yr. So, Coal & Oil Proponents will be in Disarray Soon ! A news report yesterday talked of Coal mines being discontinued forever ! Hitherto, Investors had their own pocketbooks in mind ! 3.7 V x 1000 mAh = 3,7 Wh ~ 4 Wh per cell. Result is on the order of 2 MWh, or 12 minutes at full power. "...Cusick also said that "batteries can smooth the ebbs and flows associated with wind and solar power by supplementing the grid when those resources are not available." I suspect that what is meant here is not so much running the Grid when the wind stops blowing, as absorbing extra power when it blows a lot. From what this article is saying the battery is for power factor correction not power delivery. I.E. Frequency control, which implies it will be used during peak demands.